Acacia, commonly known as the wattles or acacias, is a large genus of shrubs and trees in the subfamily Mimosoideae of the pea family Fabaceae. 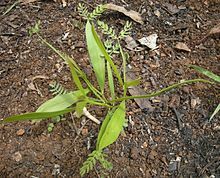 Initially it comprised a group of plant species native to Africa and Australia, with the first species A. nilotica described by Linnaeus. Controversy erupted in the early 2000s when it became evident that the genus as it stood was not monophyletic, and that several divergent lineages needed to be placed in separate genera. It turned out that one lineage comprising over 900 species mainly native to Australia was not closely related to the mainly African lineage that contained A. nilotica—the first and type species. This meant that the Australian lineage (by far the most prolific in number of species) would need to be renamed. Botanist Les Pedley named this group Racosperma, which was inconsistently adopted. Australian botanists proposed that this would be more disruptive than setting a different type species (A. penninervis) and allowing this large number of species to remain Acacia, resulting in the two African lineages being renamed Vachellia and Senegalia, and the two New World lineages renamed Acaciella and Mariosousa. This was officially adopted, but many botanists from Africa and elsewhere disagreed that this was necessary. A number of species have been introduced to various parts of the world, and two million hectares of commercial plantations have been established. The heterogeneous group varies considerably in habit, from mat-like subshrubs to canopy trees in forest. The genus was first described from Africa by C. F. P. von Martius in 1829. Several hundred combinations in Acacia were published by Pedley in 2003. The genus of 981 species, Acacia s.l., in the subfamily Mimosoideae of the pea family Fabaceae is monophyletic. All but 10 of its species are native to Australia, where it constitutes the largest plant genus. Following a controversial decision to choose a new type for Acacia in 2005, the Australian component of Acacia s.l. now retains the name Acacia. At the 2011 International Botanical Congress held in Melbourne, the decision to use the name Acacia, rather than the proposed Racosperma for this genus, was upheld. Other Acacia s.l. taxa continue to be called Acacia by those who choose to consider the entire group as one genus. Australian species of the genus Paraserianthes s.l. are deemed its closest relatives, particularly P. lophantha. The nearest relatives of Acacia and Paraserianthes s.l. in turn include the Australian and South East Asian genera Archidendron, Archidendropsis, Pararchidendron and Wallaceodendron, all of the tribe Ingeae. The origin of "wattle" may be an Old Teutonic word meaning "to weave". From around 700 A.D. watul was used in Old English to refer to the interwoven branches and sticks which formed fences, walls and roofs. Since about 1810 it refers to the Australian legumes that provide these branches. One species is native to Madagascar, one to Reunion island, 12 to Asia, and the remaining species (over 900) are native to Australasia and the Pacific Islands. These species were all given combinations by Pedley when he erected the genus Racosperma, hence Acacia pulchella, for example, became Racosperma pulchellum. However these were not upheld with the retypification of Acacia. Acacias in Australia probably evolved their fire resistance about 20 million years ago when fossilised charcoal deposits show a large increase, indicating that fire was a factor even then. With no major mountain ranges or rivers to prevent their spread, the wattles began to spread all over the continent as it dried and fires became more common. They began to form dry, open forests with species of the genera Allocasuarina, Eucalyptus and Callitris (cypress-pines). The southernmost species in the genus are Acacia dealbata (silver wattle), Acacia longifolia (coast wattle or Sydney golden wattle), Acacia mearnsii (black wattle), and Acacia melanoxylon (blackwood), reaching 43°30' S in Tasmania, Australia. An Acacia-like 14 cm long fossil seed pod has been described from the Eocene of the Paris Basin. Acacia like fossil pods under the name Leguminocarpon are known from late Oligocene deposits at different sites in Hungary. Seed pod fossils of †Acacia parschlugiana and †Acacia cyclosperma are known from Tertiary deposits in Switzerland,. †Acacia colchica has been described from the Miocene of West Georgia. Pliocene fossil pollen of an Acacia sp. has been described from West Georgia and Abkhazia. Oldest records of fossil Acacia pollen in Australia are from the late Oligocene epoch, 25 million years ago. They are present in all terrestrial habitats, including alpine settings, rainforests, woodlands, grasslands, coastal dunes and deserts. In drier woodlands or forest they are an important component of the understory. Elsewhere they may be dominant, as in the Brigalow Belt, Myall woodlands and the eremaean Mulga woodlands. In Australia, Acacia forest is the second most common forest type after Eucalypt forest, covering 980,000 square kilometres (378,380 sq mi) or 8% of total forest area. Acacia is also the nation’s largest genus of flowering plants with almost 1,000 species found. Several of its species bear vertically oriented phyllodes, which are green, broadened leaf petioles that function like leaf blades, an adaptation to hot climates and droughts. Some phyllodinous species have a colourful aril on the seed. A few species have cladodes rather than leaves. Aboriginal Australians have traditionally harvested the seeds of some species, to be ground into flour and eaten as a paste or baked into a cake. The seeds contain as much as 25% more protein than common cereals, and they store well for long periods due to the hard seed coats. In addition to utilizing the edible seed and gum, the people employed the timber for implements, weapons, fuel and musical instruments. In ancient Egypt, an ointment made from the ground leaves of the plant was used to treat hemorrhoids. A number of species, most notably A. mangium (hickory wattle), A. mearnsii (black wattle) and A. saligna (coojong), are economically important and are widely planted globally for wood products, tannin, firewood and fodder. A. melanoxylon (blackwood) and A. aneura (mulga) supply some of the most attractive timbers in the genus. Black wattle bark supported the tanning industries of several countries, and may supply tannins for production of waterproof adhesives. Acacia is repeatedly mentioned in the Book of Exodus, perhaps referring to Acacia raddiana, in regards to the construction of the Tabernacle. Acacia is a common food source and host plant for butterflies of the genus Jalmenus. The imperial hairstreak, Jalmenus evagoras, feeds on at least 25 acacia species. Wattle bark collected in Australia in the 19th century was exported to Europe where it was used in the tanning process. One ton of wattle or mimosa bark contained about 150 lbs of pure tannin. Some species of acacia - notably A. baileyana, A. dealbata and A. pravissima - are cultivated as ornamental garden plants. The 1889 publication 'Useful native plants of Australia' describes various uses for eating. Some species of acacia contain psychoactive alkaloids, and some contain potassium fluoroacetate, a rodent poison. ^ Kyalangalilwa B, Boatwright JS, Daru BH, Maurin O, van der Bank M (2013). "Phylogenetic position and revised classification of Acacia s.l. (Fabaceae: Mimosoideae) in Africa, including new combinations in Vachellia and Senegalia". Botanical Journal of the Linnean Society. 172 (4): 500–523. doi:10.1111/boj.12047. ^ a b c Thiele, Kevin R. (February 2011). "The controversy over the retypification of Acacia Mill. with an Australian type: A pragmatic view" (PDF). Taxon. 60 (1): 194–198. doi:10.1002/tax.601017. Retrieved 15 November 2015. ^ Brummitt, R. K. (December 2010). "(292) Acacia: a solution that should be acceptable to everybody" (PDF). Taxon. 59 (6): 1925–1926. doi:10.1002/tax.596050. Retrieved 19 November 2015. ^ a b Smith, Gideon F. & Figueiredo, Estrela (2011). "Conserving Acacia Mill. with a conserved type: What happened in Melbourne?". Taxon. 60 (5): 1504–1506. doi:10.1002/tax.605033. Retrieved 27 September 2016. ^ Brown, Gillian K.; Daniel J. Murphy & Pauline Y. Ladiges (2011). "Relationships of the Australo-Malesian genus Paraserianthes (Mimosoideae: Leguminosae) identifies the sister group of Acacia sensu stricto and two biogeographical tracks". Cladistics. 27 (4): 380–390. doi:10.1111/j.1096-0031.2011.00349.x. ^ Brown, Gillian K.; Murphy, Daniel J.; Miller, Joseph T.; Ladiges, Pauline Y. (1 October 2008). "Acacia s.s. and its Relationship Among Tropical Legumes, Tribe Ingeae (Leguminosae: Mimosoideae)". Systematic Botany. 33 (4): 739–751. doi:10.1600/036364408786500136. ^ Ellesmore, Windsor (2002). "Surgical History of Haemorrhoids". In Charles MV. Surgical Treatment of Haemorrhoids. London: Springer. ^ Biology of Australian butterflies. Kitching, R. L. (Roger Laurence), 1945-, CSIRO (Australia). Collingwood, VIC, Australia: CSIRO Pub. 1999. ISBN 978-0643050273. OCLC 40792921. ^ Leong, L. E.; Khan, S.; Davis, C. K.; Denman, S. E.; McSweeney, C. S. (2017). "Fluoroacetate in plants - a review of its distribution, toxicity to livestock and microbial detoxification". Journal of Animal Science and Biotechnology. 8: 55. doi:10.1186/s40104-017-0180-6. PMC 5485738. PMID 28674607.